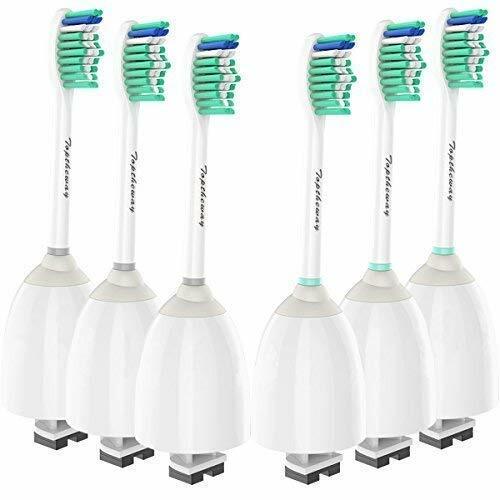 ☆【For Philips Sonicare 】: Sonicare Replacement Brush Heads For Philips Sonicare DiamondClean,FlexCare,HealthyWhite, EasyClean, Essence+(Plus), Compatible for HX3/6/9 Series,Such as HX6500 HX6511 HX6530 HX9340 HX6950 HX6710HX9322 HX9331 HX9332 HX9334 HX9336 HX9340 HX9342 HX9350, HX9351 HX9352 HX9361 HX9362 HX9371 HX9372 HX9381 HX9382 and so on. ☆★NOTICE: Not for Essence/E-Series/Advance/Elite/CleanCare/Extreme. 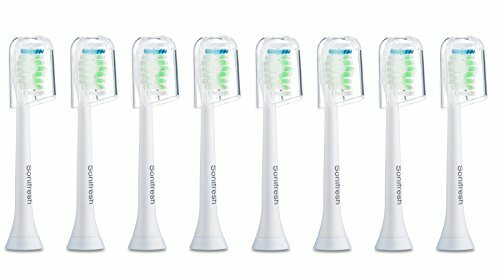 8 DURABLE SONICARE BRUSH HEADS: Get the most out of your Philips Sonicare toothbrush with your new Philips Sonicare toothbrush heads. 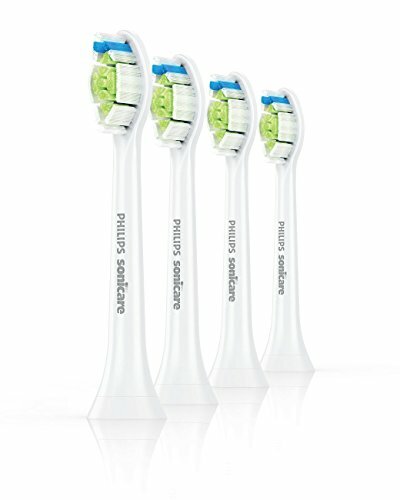 Use your Sonicare with these durable brushes. 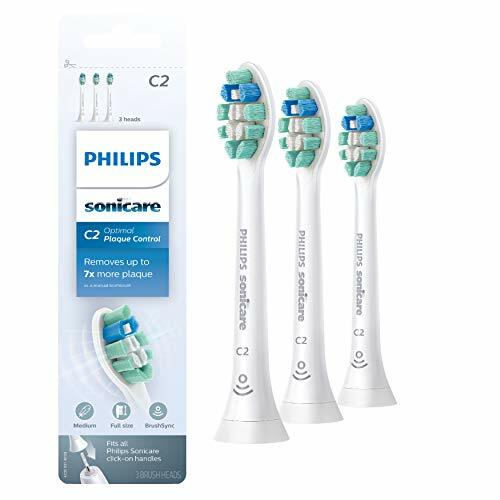 COMPATIBLE WITH YOUR SONICARE BRUSH:Every Philips Sonicare replacement is compatible with Sonicare Diamond Clean, FlexCare Platinum, FlexCare+, HealthyWhite, HealthyWhite+, Sonicare 2 Series, Sonicares 3 Serie, PowerUp. 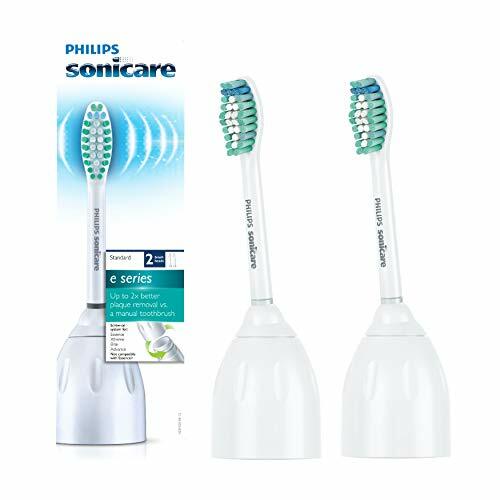 CONTOURED BRISTLES: The Philips Sonicare brush heads use contoured bristles with rounded tips to fit the shape of your teeth and help your Philips Sonicare brush remove plaque build-up. 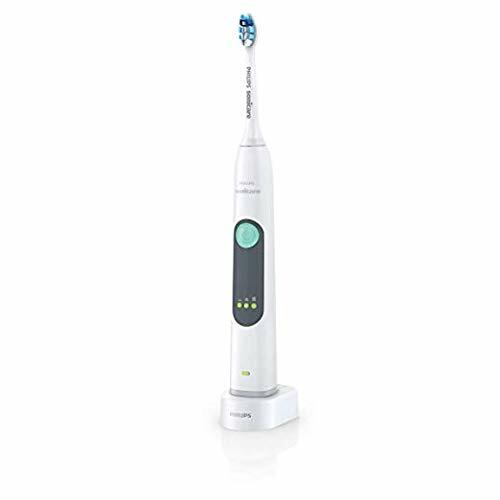 SUPERIOR CLEANING PERFORMANCE: The Sonicare heads combine their functional design with sonic motion to remove plaque 5 x more effectively than any manual toothbrush. 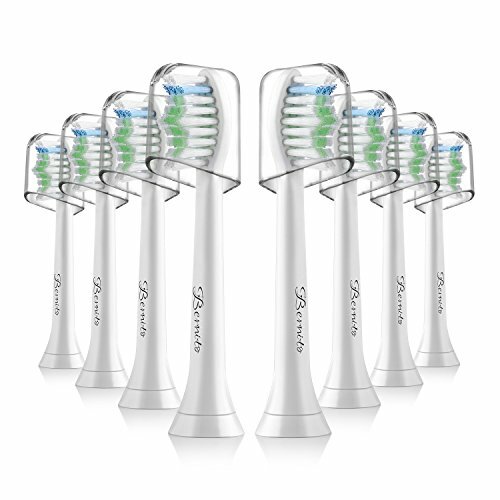 TRY WITHOUT RISK: We truly believe in the high quality of our Philips Sonicare heads. If you are not satisfied with your purchase, we will refund your order, no questions asked. 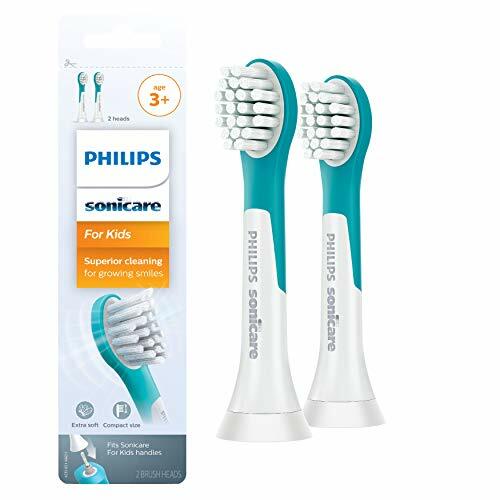 Compatible Multiple Handles - Snap-on brush head system fits for Philips Sonicare ProtectiveClean, DiamondClean, Plaque Control, Gum Health, FlexCare, FlexCare Platinum, HealthyWhite, HydroClean, EasyClean, Power Up, Essence+ and Sonicare for Kids toothbrush. 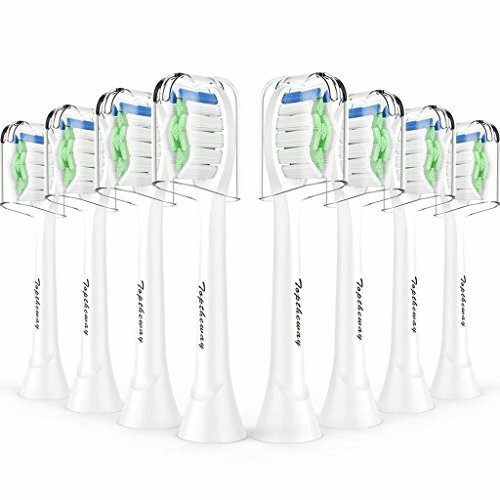 Functional Design - The replacement sonicare toothbrush heads made with end-rounded US Dupont Tynex Nylon bristles,bristles has medium hardness and soft,fit the natural shape of your teeth.Removes up to 100% more stains for whiter teeth in just one week. 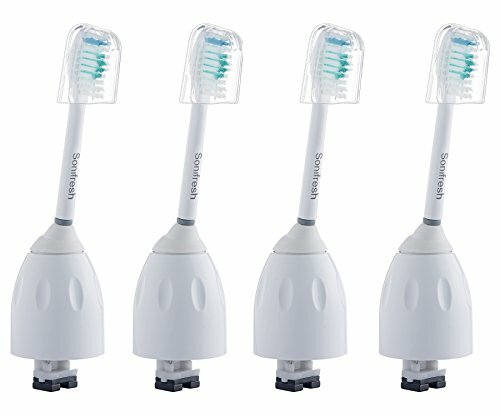 Hygienic Travel Cap - These replacement Sonicare brush heads come with caps for hygienic storage, effectively protect your toothbrush head is not outside pollution. Each brush heads base has number as a mark for distinction,you can share your family USE. Money Back Guarantee - We Provide 100% Satisfaction Guaranteed or Your Money Back Service,if you have any question just contact us. 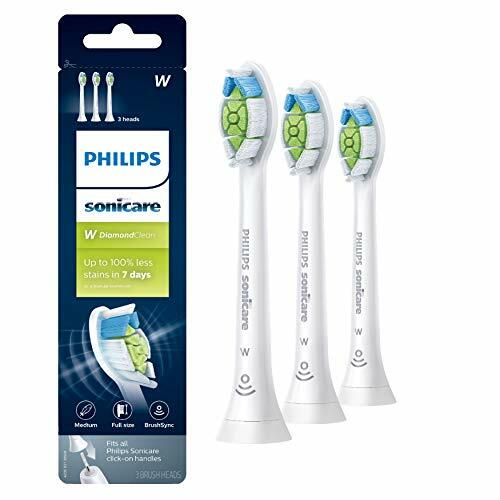 --- #1 DENTIST'S OFFICIAL STANDARD REPLACEMENT TOOTHBRUSH HEADS FOR PHILIPS SONICARE --- The best substitute for Philips Sonicare toothbrush heads. FDA approved and has passed dentist's official health and safety standard, fulfilled by Amazon FBA. --- THE BLUE REMINDER BRISTLE --- Dentist recommends to replace brush heads every three to four months or more often. To remind you about this important thing, we have the blue reminder bristle that will fade when it's time for the replacement. 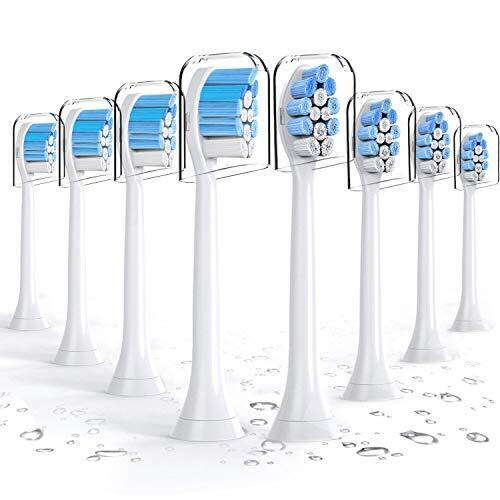 It has unique radial-trimmed, contoured bristles which fit the natural shape of your teeth, with larger surface area to massage teeth and gum. --- WHAT OUR CUSTOMERS SAY --- Here is what some of our customers say: "This brushes do a great job cleaning my plaque, I will re-order them again", "Works great, I was given a great report by my dentist", "Bristles are soft and it fits perfectly", "I find the brushes to be very (soft) and leaving your teeth nice & white". If our Oralfit (TM) not to keep your teeth pearly white, feel free to return it to us and get your money back guarantee! 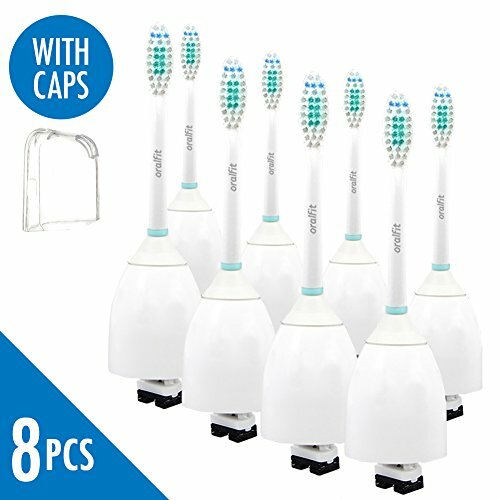 --- HYGIENIC CAPS INCLUDED --- Keep your Sonic toothbrush replacement heads clean with the hygienic caps included. No more worries about bacteria that might cause you dental problems. Buy 3 get 10% off, buy 2 get 5% off. So, what are you waiting for? 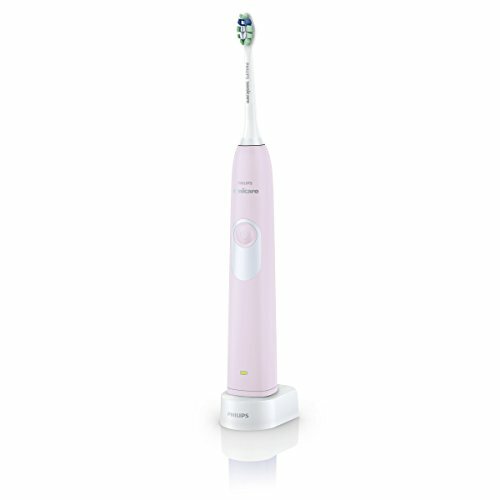 Hurry and grab this electric toothbrush heads NOW! 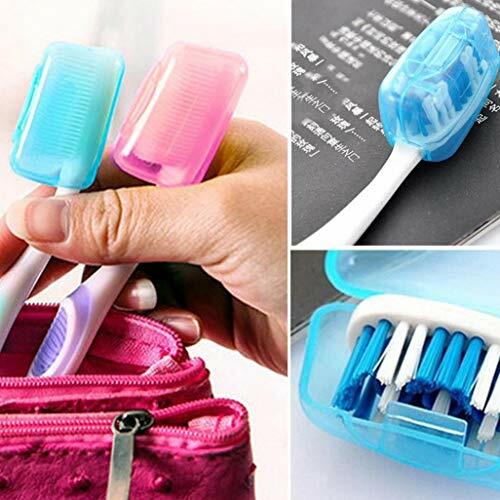 A perfect solution to organize your toothbrush and brush heads in one case. Comes with a white rubber band that can keep your toothbrush firmly in the case. The toothbrush and brush heads are not included in the package. 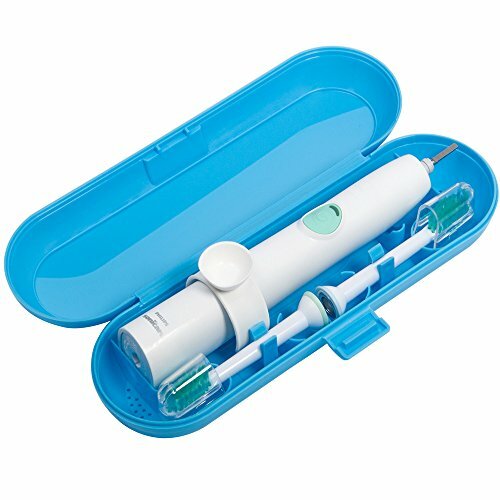 iHealthia toothbrush case is designed to hold 1 Philips Sonicare toothbrush handle and 2 sonicare brush heads for hygienic storage and protective transportation. 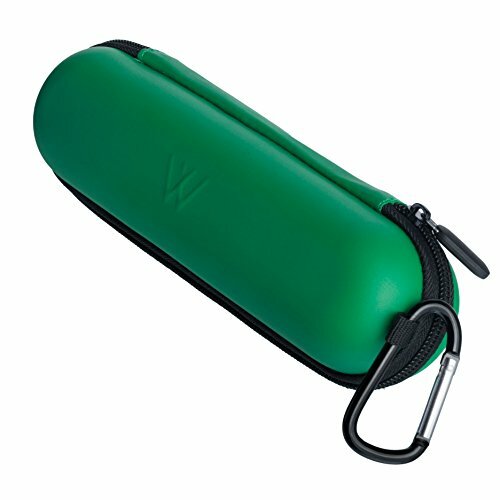 Made by hard plastic, the protective carrying case closes securely. 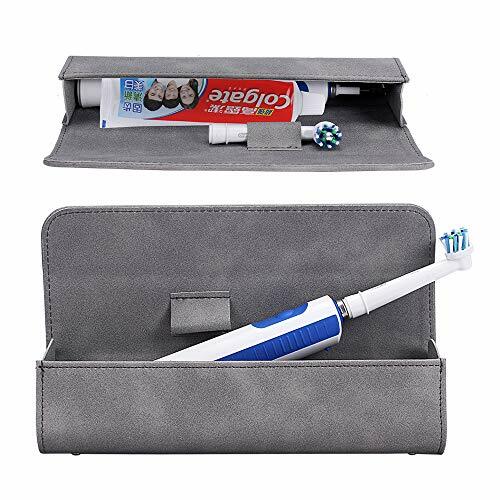 The travel toothbrush case is lightweight but durable. 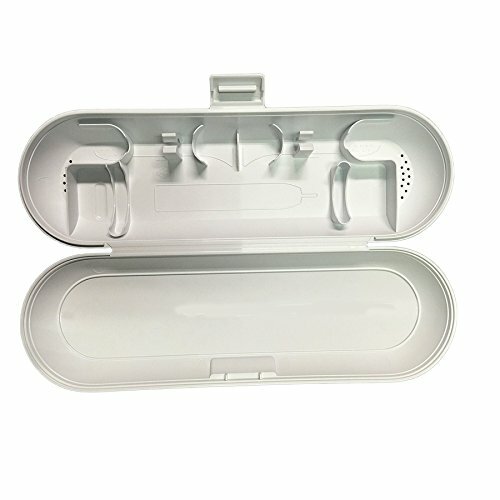 The hygienic storage case ventilates freely through small holes at the bottom to keep sonicare toothbrush heads dry and inhibit bacteria growth. 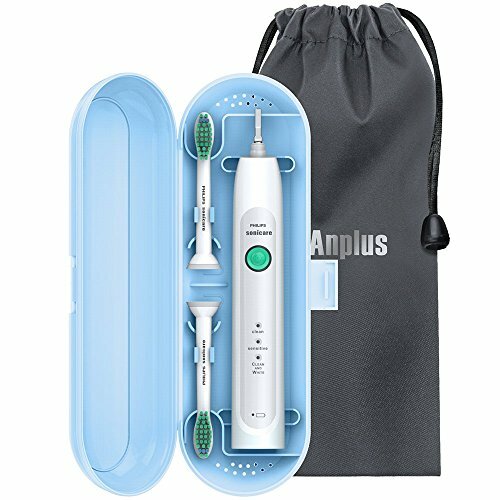 Compatible with most snap-on Philips Sonicare rechargeable toothbrush: FlexCare, HealthyWhite, 2 Series Plaque Control, 3 Series Gum Health, EasyClean and HydroClean Handles (excludes screw-on type handle Essence, and Airfloss). 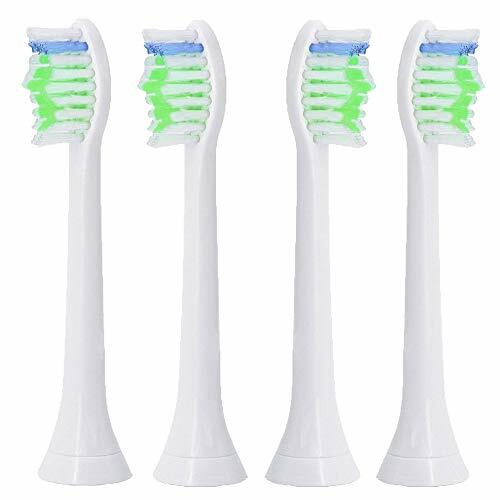 Fit for Philips Sonicare HX3 HX5 HX6 HX9 series, HX6911, HX6431, HX6972, HX6150, HX6711, HX6710, HX6733, HX6311, HX6711, HX6730, HX6731, HX6341, HX6930, HX6950, HX6712, HX6732, 700 series. 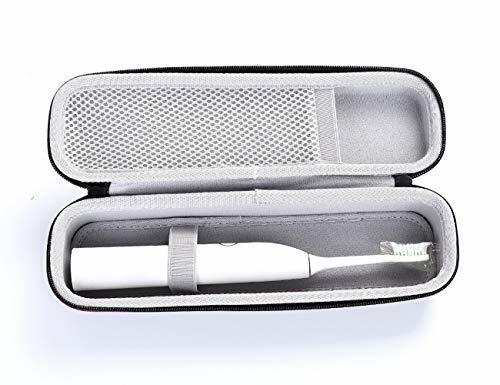 Reliable Quality - 1x Philips Sonicare travel case, 1x Soft Pouch, backed by 100% money back guarantee, this is totally no-risk warranty, click the orange button to order now! 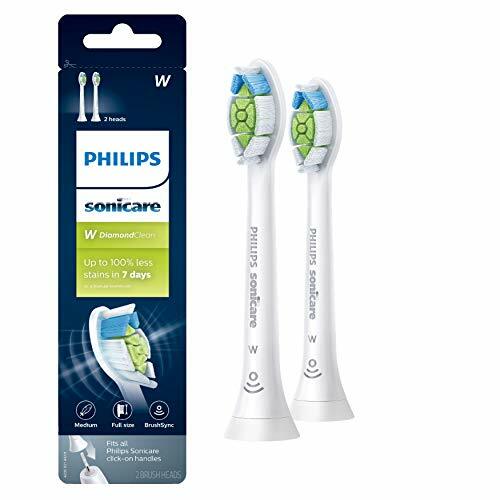 Philips Sonicare' s best whitening brush head, Standard size. 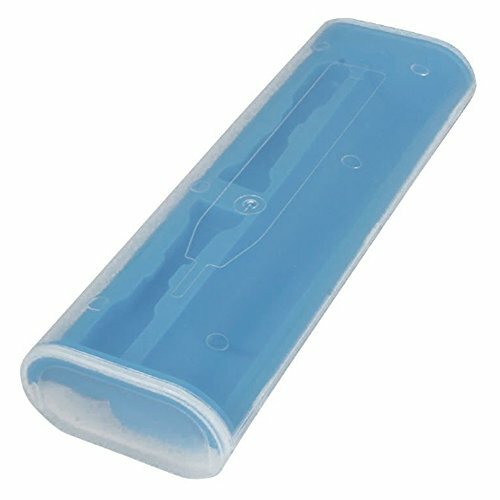 This toothbrush case is suitable for Philips Sonicare: HX9111/21,HX6972/03,HX6911/50,HX8918/10 ,HX8911/04,HX8931/10,HX6732/45,HX6712/43,HX6731/02,HX6762,HX6251/41,HX6251/40,HX6232/20,HX6251/42,HX6632/25,HX6632/24,HX6631/13,HX6515/06,HX6511/50,HX6511/43,HX3214/21,HX3214/11,HX3214/02,HX3214/01. 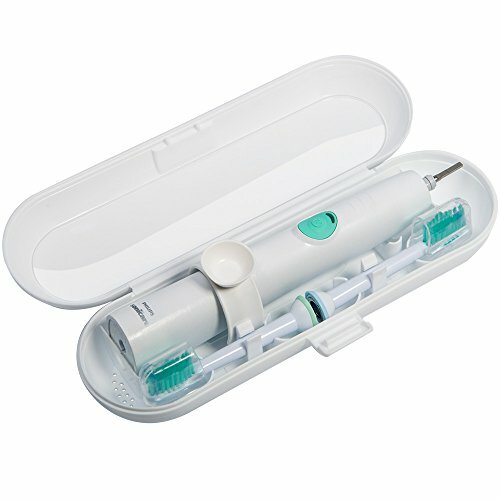 This travel case can fit one Philips Sonicare toothbrush handle and two brush heads. 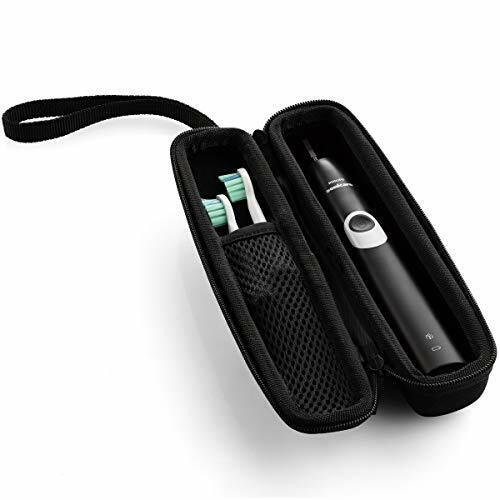 This travel case can help you to keep your electric toothbrush and brush heads clean and tidy when you travel,it is very portable and convenient. 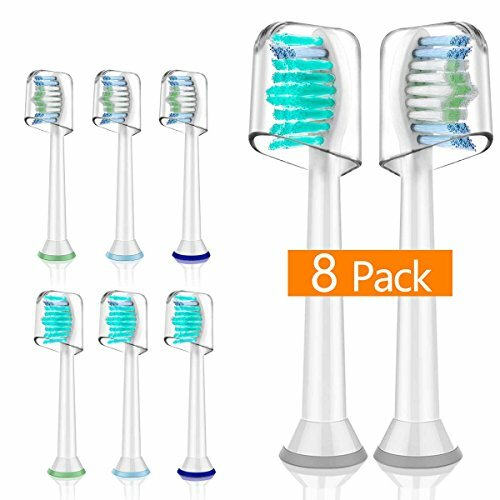 The shake-proof sticker can help to keep your toothbrush stable in the case. All the materials are made of food-safe plastic materials, will not be harmful to your health. Note: only the travel case and the shake-proof sticker are in the package. The electric toothbrush and brush heads are not included. 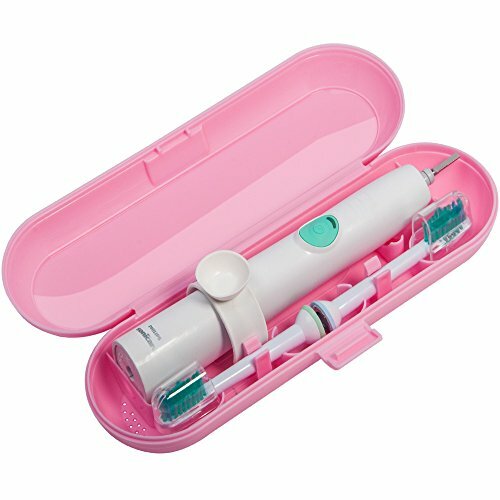 Easily carry one toothbrush base and 2 toothbrush heads, convenient travel, travel to carry use. 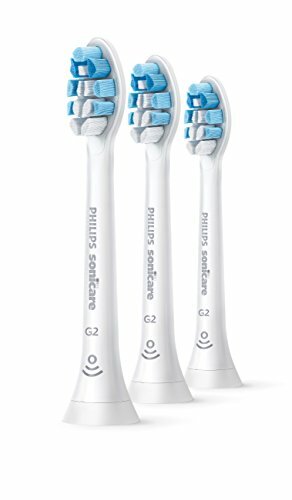 Made to fit Philips Sonicare 2 / 3 / ProtectiveClean 4100 Series plaque control rechargeable electric toothbrush HX6211 / HX6631 / HX6817. 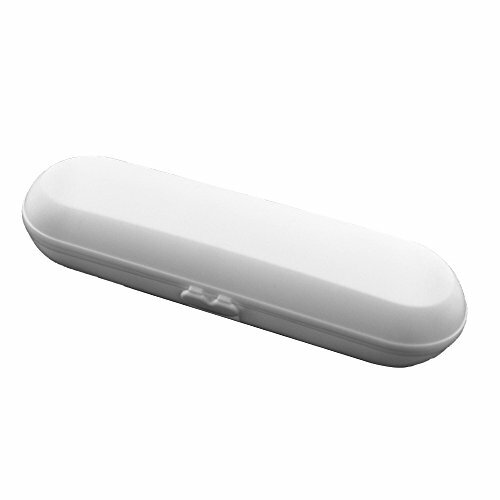 Perfectly protect your favorite device from bumps dents and scratches. This product is made from edible plastic, safety, health! 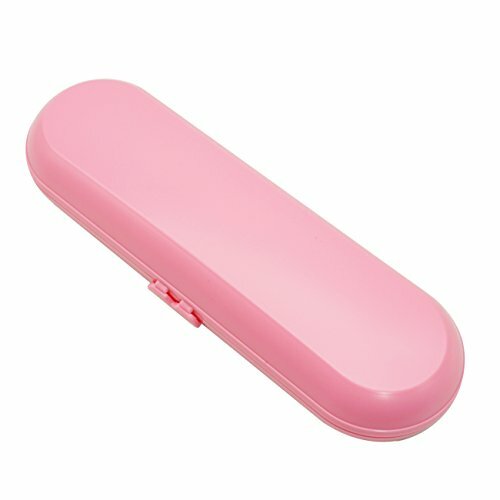 Size: 21.5x8x4.5cm; Weight: 120g; Color: pink, blue, green, purple. 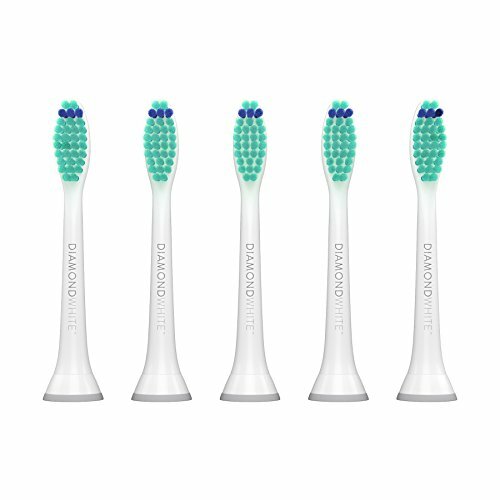 Toptheway e series toothbrush heads are made with US Dupont rounded end medical grade Nylon Bristles, which is the same material as the Philips Sonicare toothbrush head; Gentle on your gum and blue indicator bristles fade in color to let you know when it's time to replace the brush head. 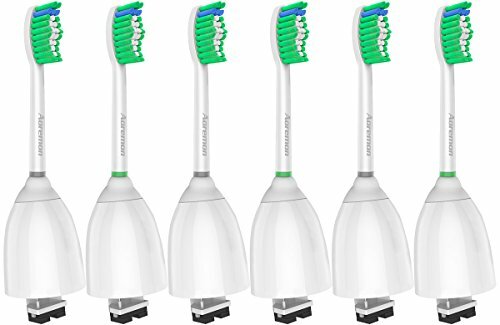 #1 STANDARD REPLACEMENT BRUSH HEAD - Great Value Tech replacement Heads are compatible with All Phillips Sonicare E Series models. 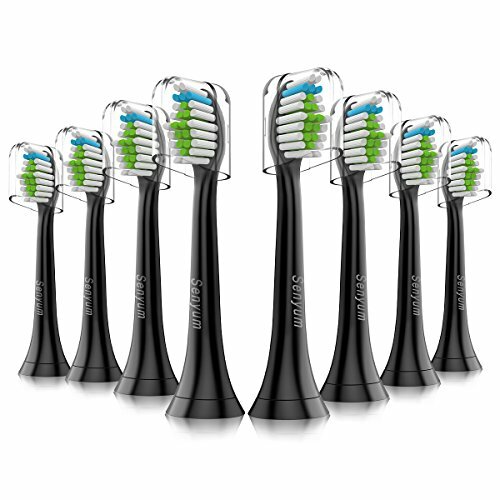 PROVEN SAFE FOR YOUR DENTAL HEALTH - Great clean with bristles that are easy on your gums. GUM HEALTH AND PLAQUE REMOVAL - The angled neck allows for better reach to remove plaque and prevent gingivitis. 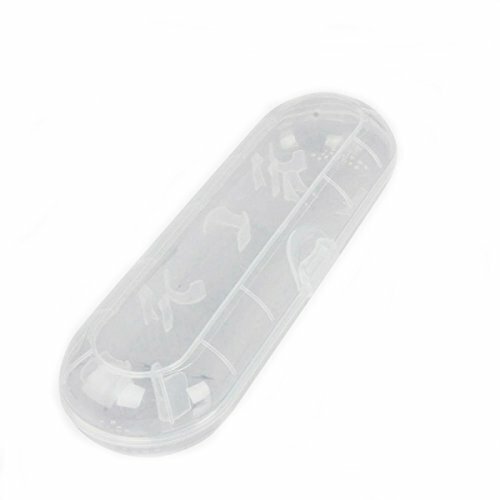 HYGIENIC CAPS INCLUDED - You do not have to worry about bacteria that might cause you dental problems. 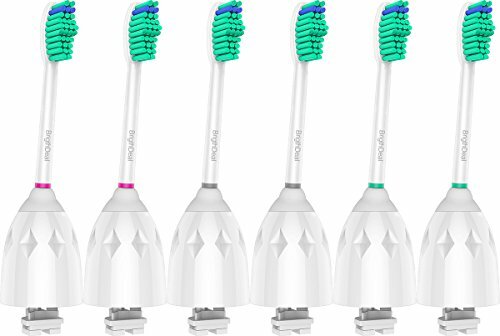 HIGHEST-QUALITY & BEST VALUE AVAILABLE - Why pay more or settle for less, Great Value Tech replacement toothbrush heads are one of the BEST. 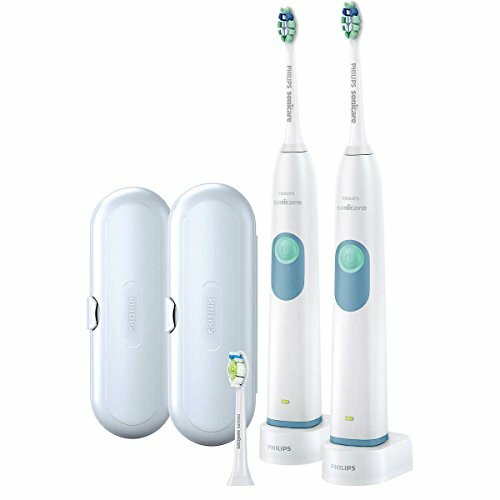 Snap-On Toothbrush System - Fits for Philips Sonicare 2 Series Plaque Control, 3 Series Gum Health, DiamondClean, ProtectiveClean, EasyClean, Essence+, FlexCare, FlexCare+, FlexCare Platinum, HealthyWhite, HealthyWhite+, Power Up, Sonicare for Kids and HydroClean electric handles. 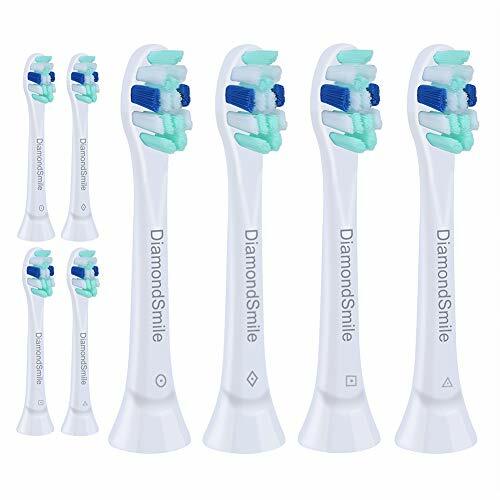 Advanced Plaque Removal - DiamondSmile replacement brush heads made with end-rounded US Dupont Tynex Nylon bristles,bristles has medium hardness and soft.This toothbrush head features densely-packed, high-quality tufts to effectively remove plaque. Also features specially curved power tufts to easily reach teeth at the back of the mouth. 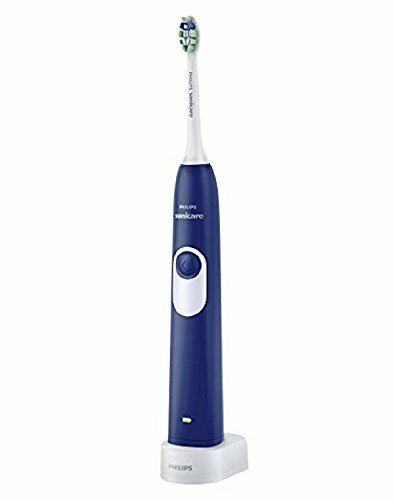 Replacement Reminder - Blue reminder bristles will fade to white when a replacement toothbrush head is needed.For optimal results, replace your brush head every 3 months. 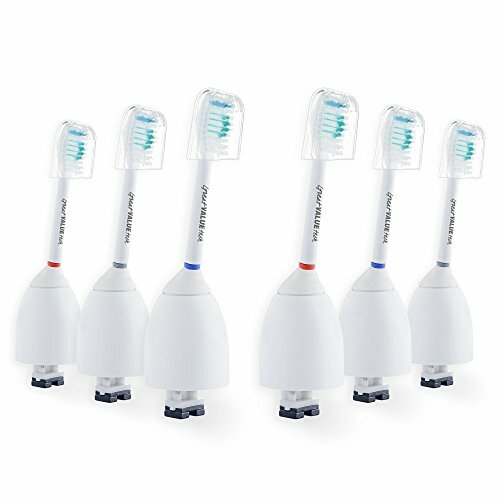 Hygienic Travel Cap - DiamondSmile replacement Sonicare toothbrush heads come with caps for hygienic storage,effectively protect your toothbrush head is not outside pollution.Each brush base has a different mark as a distinction, so you can easily tell every brush apart. Satisfaction Guarantee - We Provide 100% Satisfaction Guaranteed or Your Money Back Service,If you have any issue just contact us. INDICATOR BRISTLES- Blue indicator bristles fade in color to let you know when it's time to replace the brush head. SEALED PACKAGE-You will receive your sealed box in BrightDeal Branded Packaging. 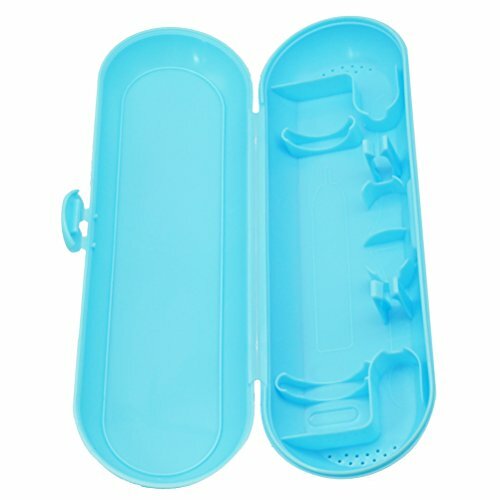 3.This plastic travel case will fit one Philips Toothrush handle along with 2 brush heads.Keep your Braun toothbrushes safe and protected with this travel case. 4.Please confirm your toothbrush model and choose correct size case. 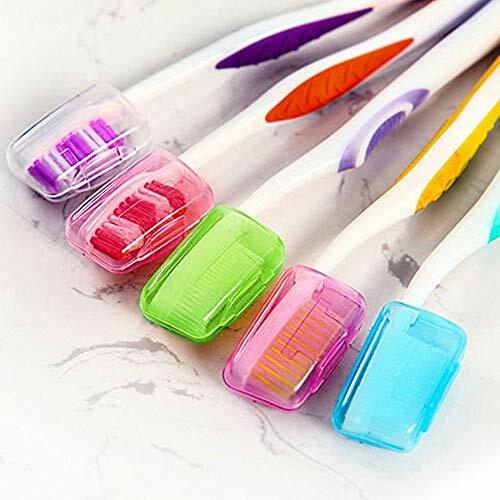 5.Made of food-grade Security environmental protection Plastic.Put toothbrush inside, to prevent dust falling above toothbrush, can well inhibit the growth of bacteria.Portable, great for travel. Perfect gift. 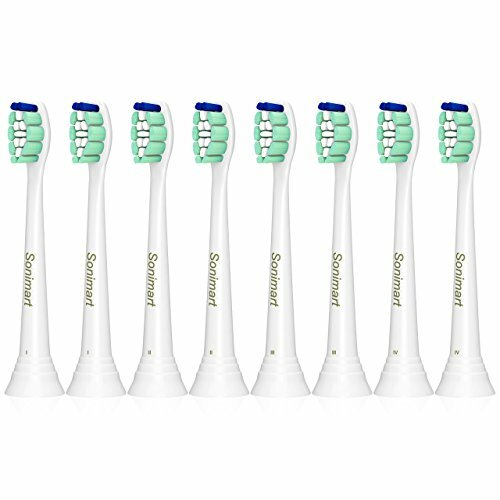 Disclaimer:These toothbrush heads are manufactured independently by Sonifresh.Blue indicator bristles fade halfway so you know when to replace your brush. (Dentists recommend replace the brush head at least once every 3 months). 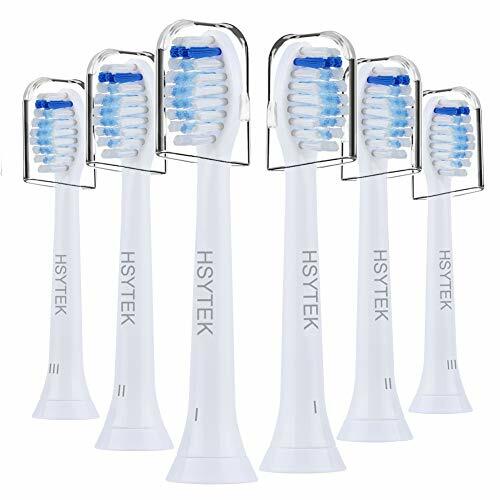 High quality Generic Replacement Brush Heads made with end-rounded US Dupont Tynex Nylon Bristles for offer exceptional cleaning of tooth surface and deep between the teeth. 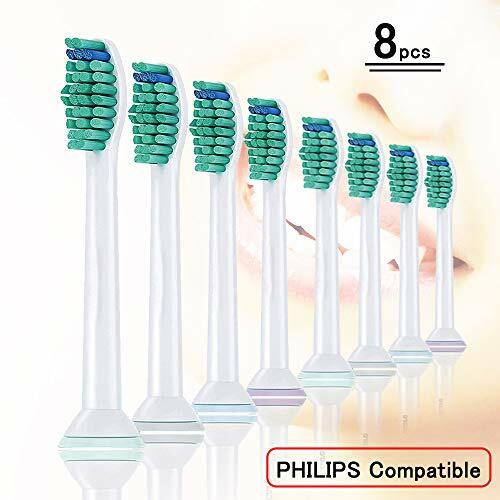 Toothbrush heads are proven to reduce gingivitis up to 100% better than a manual toothbrush ,effectively removes plaque without irritating gums. The 2 E-Series replacement brush heads come with caps for hygienic storage and travel,100% Satisfaction Guaranteed or Your Money Back. 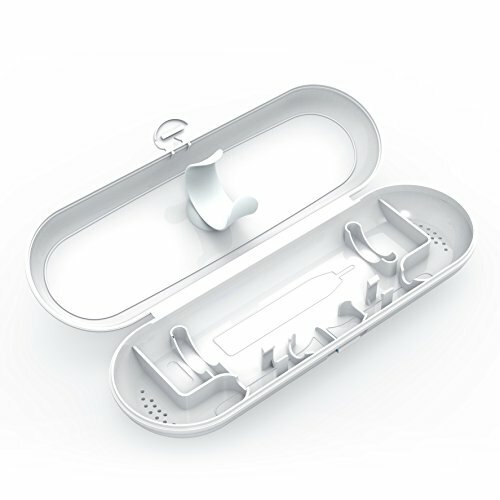 HIGHLY PROTECTIVE - Our hard shell electric toothbrush case is highly protective yet lightweight. Carabiner included for easy carrying, storing and hanging. 【TRUSTWORTHY】1 Month Moneyback policy; 3 years quality warranty; Friendly online communication service. 【REMARKS】 Only case for sale, Devices and other accessories are not included.